French police said they arrested more than 100 "yellow vest" demonstrators in Paris on Saturday as clashes broke out with protestors taking to the streets for a 23rd week of anti-government marches. 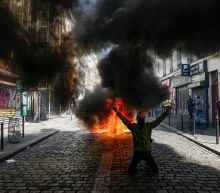 AFP journalists reported scuffles between police and protesters in the afternoon, after hours of calm, as police used anti-riot grenades and tear gas to disperse marchers in the centre of the French capital. Some protesters threw bottles and other objects at police and set fire to vehicles, safety barriers and bins. WOODLAND PARK, N.J. – The same day a fire nearly destroyed Notre Dame Cathedral, a New Jersey man was arrested for allegedly refusing to leave a New Jersey church. Just two days later, that same man, Marc Lamparello, was arrested in St. Patrick's Cathedral, in New York, carrying two gas cans, two bottles of lighter fluid and two lighters, police said. Lamparello had purchased a one-way ticket to Rome that was scheduled to depart Newark, New Jersey, on Thursday evening. The two Jewish parties that dared to talk openly about peace with the Palestinians captured just 10 seats in the 120-seat parliament, and opinion polls indicate dwindling support for a two-state solution among Jewish Israelis. 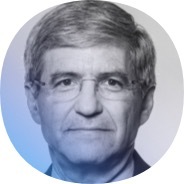 "The majority of the people in the state of Israel no longer see a two-state solution as an option," said Oded Revivi, the chief foreign envoy for the Yesha settler council, himself an opponent of Palestinian independence. 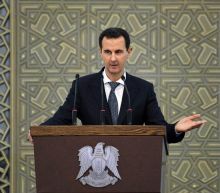 "If we are looking for peace in this region, we will have to look for a different plan from the two-state solution." 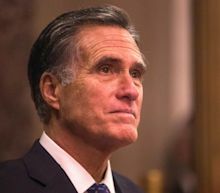 Sen. Mitt Romney, R-Utah, said Friday that he was “sickened” by what he read in special counsel Robert Mueller's report on Russian interference in the 2016 election and Donald Trump's attempts to cover it up. In a scathing statement posted to Twitter, Romney became one of the first Republican members of Congress, and the most prominent, to criticize the Trump administration and the president for the behavior detailed by Mueller. The business of government can move on,” Romney wrote. A week-long series of events commemorating the 20th anniversary of the Columbine High School massacre culminates on Saturday with a remembrance ceremony celebrating the lives of the 13 victims slain in the rampage. On April 20, 1999, two Columbine students, just three weeks shy of graduation, stormed the suburban Denver school armed with shotguns and semiautomatic weapons, fatally shooting 12 students and a teacher before committing suicide. 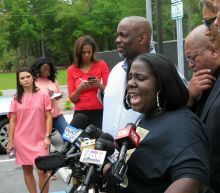 For the relatives of those they killed, April 20 evokes a mix of emotions from sorrow and anguish to fond memories of loved ones. 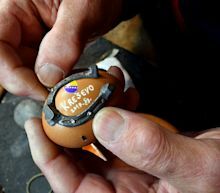 To be worthy of the title of master, a blacksmith in Kresevo in central Bosnia had to perform a delicate task -- shoe an egg without breaking it. It's an Easter tradition requiring a blacksmith to decorate an egg shell by nailing on it a miniature iron horseshoe. Now Stjepan Biletic wants to have this ancient know-how recognised by UNESCO as part of the world's cultural heritage. Warfare History Network Security, Asia The first torpedo struck farthest aft. Over the next 30 seconds three more warheads detonated against the massive aircraft carrier's hull, working their way forward. The explosions and instant flooding immediately killed scores of men, many asleep in their bunks. A Kansas man is receiving the ire of the scientific community for his decision to sell a skeleton of a young T. rex on eBay. Fossil hunter Alan Detrich posted the relic on the auction site hoping to attract the attention of a wealthy collector. A number of people in the scientific community fear that instead of keeping the specimen on display in a museum for public enjoyment and research, the baby T. rex will disappear into a private collection, cutting it off from future research opportunities. 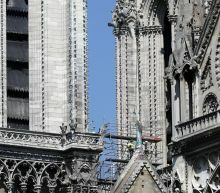 Architects and construction workers have stabilized the damaged structure of Notre Dame cathedral, four days after a fast-spreading fire ravaged the iconic Paris building, and firefighters were leaving the site Friday night, a fire service official said. The promising development came as Notre Dame's parishioners celebrated Good Friday in a nearby church, praying for the damaged monument and celebrating its rescued relics such as the Crown of Thorns believed to have been worn by Jesus at his crucifixion. 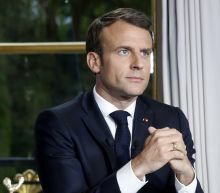 "There is no more risk the edifice's walls could fall down," Lt. Col. Gabriel Plus, chief spokesman for the Paris fire service, told The Associated Press. 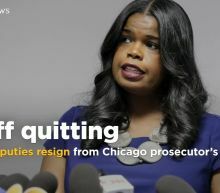 Two top deputies to the Chicago prosecutor whose office handled the Jussie Smollett case are resigning. The two men vying to be Ukraine's next president traded insults in a raucous debate on Friday in front of thousands of supporters before an election that could put a comedian with no political experience in charge of a country at war. The debate, held in a hulking football stadium, was one of the last opportunities for incumbent President Petro Poroshenko to try to overhaul a significant lead in the opinion polls enjoyed by his challenger Volodymyr Zelenskiy, a comic. At stake in Sunday's election is the leadership of a country on the frontline of the West's standoff with Moscow following 2014 protests that caused Poroshenko's Kremlin-backed predecessor to flee into exile, and foreshadowed Moscow's annexation of Crimea. Secretary of State Mike Pompeo vowed Friday the United States would keep taking "tough action" on Russia after Special Counsel Robert Mueller revealed widespread attempts by Moscow to help elect President Donald Trump. A day after Mueller's 400-page report was released publicly, Pompeo said that the Trump administration had raised interference in the 2016 election during each meeting with Russia. "We will make very clear to them that this is unacceptable behavior," Pompeo told a news conference after talks with the Japanese foreign and defense ministers. The Army may have chosen Sig Sauer's P320 for its Modular Handgun System program over Glock's offerings, but that doesn't mean you have to: Glock plans on releasing a civilian variant of its 9mm Glock 19 pistol to civilian buyers this month, the company announced today. Glock's commercial pistol, dubbed the 19X, is the company's first stab at a crossover model, combining the Glock 17 frame with a Glock 19 barrel. Northern Irish police said a “new brand of terrorism” was responsible for the death of a well-respected journalist who was killed last week as they announced the arrest of two teenagers in connection with the killing. During a press conference on Saturday, police in Northern Ireland announced that they had arrested two men, 18 and 19 years old, under the country's terrorism act in connection with McKee's murder. On Friday, police blamed McKee's murder on gunshot wounds fired indiscriminately, and released footage of a masked gunman firing during the riots. If you forget a key ingredient for your Easter meal Sunday or need more eggs and candy, you have some options. Several grocery stores will be open Easter Sunday, along with drugstore chains CVS, Walgreens and Rite Aid. Some pharmacies will be closed or have limited hours for the holiday. He says firefighters have been able to cool down the walls and debris that fell inside the cathedral from the roof. He says "it's a miracle that the cathedral is still standing, and that all the relics were saved," he said. The fire Monday night burned through the network of enormous centuries-old oak beams supporting the monument's vaulted stone ceiling, dangerously weakening the building. Brands sometimes go too hard during Pride season. Every once in a while, however, they get it right. 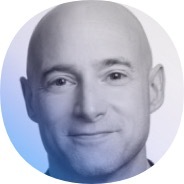 The year 2019 has already brought us one *actually good* example. Ukrainians voted on Sunday in an election expected to thrust a comedian with no prior political experience and few detailed policies into the presidency of a nation at war and hungry for change. At stake is the leadership of a country on the frontline of the West's standoff with Russia following Moscow's annexation of Crimea and support for a pro-Russian insurgency in eastern Ukraine. 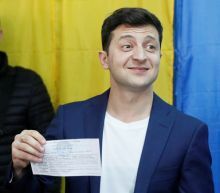 Surveys make Volodymyr Zelenskiy, who plays a fictitious president in a TV series, the runaway favorite to defeat incumbent Petro Poroshenko, whose popularity has been hurt by patchy efforts to halt corruption and sliding living standards.